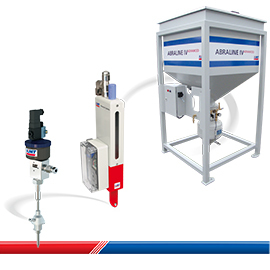 Abrasive supply systems control the entire supply chain for abrasive in waterjet cutting machines. The abrasive consumption is a key cost factor in the operation of a waterjet cutting unit. By controlling all system parameters, the cutting results can be optimized and the consumption of abrasive can be reduced. Waterjet cutting thus becomes even more cost-efficient. This is particularly the case where brittle materials such as stone, marble and glass are cut, as the uniform and constant supply of abrasive caters for fast processing without damage at low costs. Stable and repeatable operating parameters are a fundamental requirement for high-quality waterjet cutting. This applies in particular to abrasive applications used to cut brittle materials, where a constant flow of abrasive is simply a must. KMT WATERJET SYSTEMS responded to this demand by developing the FEEDLINE abrasive metering system. Controlled through a central CNC controller or a potentiometer, the FEEDLINE supplies the cutting head with the optimized flow of abrasive. This helps save material and costs. Production reliability requires constant monitoring of the entire cutting process. An economical and successful cutting process depends greatly on a constant abrasive flow rate. This fact becomes even more important when cutting brittle materials such as stone, marble or glass. Our ABRALINE feeding system precisely monitors the availability of sufficient abrasive closely during the entire cutting process. This protects your valuable material from damage and saves unnecessary costs and time. 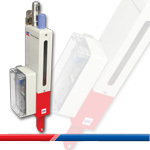 Its concept assures process stability, security and a very high degree of reliability. 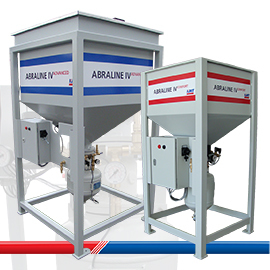 KMT offers the ABRALINE feeding system in two different sizes suitable for different requirements. The smaller version ABRALINE Comfort is sufficient for ensuring the abrasive feed for occasional cutting needs. For large cutting machines which operate continuously and with multiple cutting heads, we recommend the model ABRALINE Advanced. While it’s the combination of technology that creates the cutting process, the abrasive mixed with high-pressure water is what actually completes the supersonic erosion process – the act of cutting. Mineral hardness, density, friability, particle shape and purity all play an important part in determining the waterjet cutting result in terms of edge quality, cutting speed and abrasive consumption. Those parameters significantly influence both the technical and commercial success of your waterjet cutting operations. Being the innovative pioneer in the industry with over 40 years of experience, KMT knows about the daily challenges in your waterjet cutting world. ECOJET garnet abrasive provides a balanced cost/performance ratio for a large variety of abrasive waterjet applications. Known for its exceptional value, ECOJET garnet abrasive is a mid-level cutting abrasive with low dust, low suspended solids, and low chloride content, providing a clean cutting environment. As a result, with little variability in particle size and product, you can expect each bag of ECOJET garnet abrasive to offer the same machine uptime and quality results, every time. ECOJET garnet abrasive is available from many warehouse locations, which make the product available within a very short lead time.